We at Attify focus on mobile application security auditing and trainings. On weekends, we often spend time writing code for AppWatch – our flagship product, finding vulnerabilities and hacking hardwares. A few months back, we had a look at the Box Android and iOS apps and discovered a lot of security vulnerabilities in it. Let’s start with the Android application. We decided to start the analysis with the network traffic interception and to verify whether Box uses proper implementation of SSL Pinning. Even though the box application uses SSL, it is possible to intercept the traffic using any proxy. This is done by adding the proxy certificate into the trusted store of the Android device. Once this is done, the attacker can intercept username and password sent from the Box App. The screenshot below displays the intercepted username and password. Box App provides an additional security layer to its users by implementing pin lock on the client side for protecting its data. Pin lock is a 4-digit number in this case. We can bypass this authentication method with the help of Android backup vulnerability. It was quite straight forward to exploit this vulnerability and bypass the pin screen. This is also quite similar to the vulnerability discovered in Lastpass by Chris John Riley. Take the back up of Box app. Cover and copy .ab file : 24 bytes at a time and removing the first 24 bytes as they are a part of the .ab (Android backup file format) header. In case you’re interested, you could do a hexdump and see the 1st 24 bytes confirming that it’s a part of the android backup header. 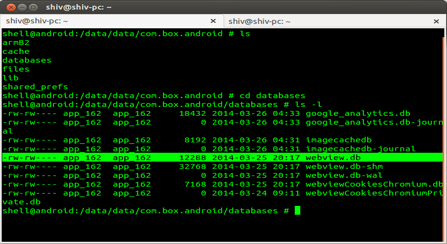 Prepare a list file of the tar archive which will be useful while repackaging the android backup file. Extract the box.tar archive in order to modify the contents. The above command will extract the contents of box.tar. Traverse to apps folder. Turns out that if we remove the pincode line completely, the application thinks that there is no pincode protection in the application, and will directly take you to the logged in section. Once we have copied the first 24 bytes (the header) we could now append the rest of the data to the android backup file. Now once everything is done, we just need to restore the backup. Webview is a simple and essential component in Android and iOS platforms, enabling smartphones and tablets to embed a simple but powerfull browser inside them. We’ll write a separate post soon on the webview based issues in Android applications, but for this blog post we won’t go into much depth of what exactly is webview and how apps become vulnerable. If you look inside the OneCloudAddNewAppsActivity is addJavasctiptInterface. The private data of Box are stored at /data/data/com.box.android and sensitive files and folders have only ‘read-write’ permissions to owner and user. These files are not accessible to other apps. We successfully tried deleting the contents as shown in below code. Another reason for webview vulnerability to be possible was the improper implementation of onReceivedSslError method. Whenever an Ssl error is received, instead of taking any preventive measures, the method simply proceeds the handler. The Box iOS application has a similar functionality as the Android one and offers users to use additional Pin screen in order to secure their Box application. However, it could be easily bypassed by runtime manipulation using Cycript. Also, you could check the current passcode of the pin screen using the topViewController. That’s all for this blog post. Feel free to get in touch with us if you would like your application audited () or would like to have a training on Android and iOS Hands-on Exploitation.